Hundreds of Syrians marched in Damascus on March 25, 2011, chanting: “Dara’a is Syria” and “We will sacrifice ourselves for Syria.” Photo by AFP/Getty Images. A violent conflict has wracked Syria since March 2011. Energized by the Arab Spring and removal of regimes in other countries, rebels in Syria took up arms to try to topple President Bashar al-Assad’s regime, which has responded with a bloody crackdown. Activists said nearly 19,000 people had died in the fighting as of August 2012. But the violence and limited visa approval have made it difficult for aid groups and reporters to enter the country to verify death tolls. This timeline begins with demonstrations in the capital, Damascus, and follows the spread of violence throughout the country and the efforts of the global community to stop the killing. 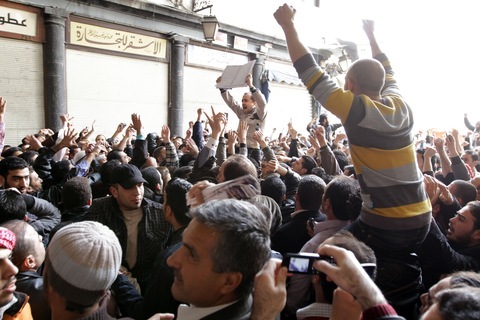 Protests in the capital city of Damascus called for the release of political prisoners. Concurrently, demonstrations in the southern city of Dara’a lead to civilian casualties by the hands of security forces. Assad (pictured above) dismisses his government, releases political prisoners, and lifts a nearly 50-year-old state of emergency. In a speech delivered at the end of the month he blames foreign entities for the unrest and orders crackdowns on demonstrators. The United States and the European Union condemn the crackdowns and impose strict sanctions on the Syrian government. Members of the Syrian ruling party quit amid continued violence. Demonstrators are shot at and tear gassed. Hostility continues and sanctions are tightened; 13 Syrian officials are added to the sanctions list in an executive order from President Obama. 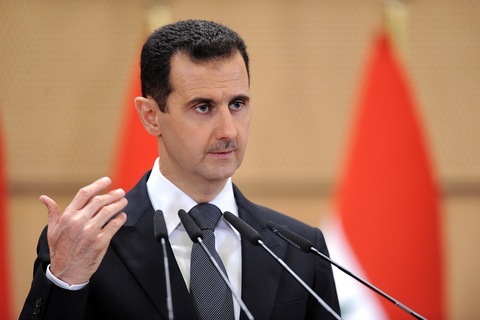 Assad rejects a peace plan backed by the Arab League and refuses to step down. Assad makes a speech that hints at changing the constitution and perhaps ending the ruling Ba’ath party’s control. The military continues to battle protestors across the country. The opposition organizes under the name Free Syrian Army and calls for members of the Syrian army to defect and join the resistance. In Hama, the fourth largest city in Syria, military tanks open fire on civilians garnering condemnation from across the globe. As violence continues to spread, U.N. Secretary-General Ban Ki-moon condemns the actions of the Syrian government. The EU imposes an embargo on oil imports from Syria. China and Russia support the Assad regime and veto a U.N. resolution that condemns the actions of the Syrian government. Both countries are hoping the conflict will resolve itself internally and they can maintain their relationships in the Middle East. The Arab League agrees to impose economic sanctions on Syria and votes to remove them from the League. This brings about a new bout of attacks by both the government and the opposition. The regime allows observers of the Arab League into the country in accordance with the leagues’ peace plan to monitor the situation but they leave after a month for security reasons. Two suicide bombs aimed at security service buildings kill 44 people in Damascus. Similar attacks carry on in the capital and continue into next year. 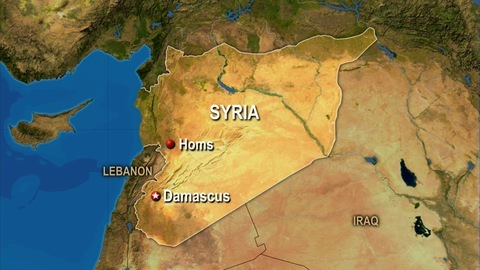 The U.S. Embassy in Damascus is closed over security concerns and American diplomats are evacuated. The peace plan backed by former U.N. Secretary-General Kofi Annan is put in place. This is the biggest diplomatic attempt to stop the violence and China and Russia support it. It ultimately fails as the assaults continue. Annan travels to Damascus to meet with Assad. There are doubts that the peace plan will yield results as Assad has agreed to other proposals in the past and never followed through with them. Fighting in Homs province leaves more than 100 people dead, including women and children, marking one of the bloodiest days of the uprising so far. As violent clashes persist, the United Nations suspends its observer mission. Rumors of bloody massacres crop up and the diplomatic process remains at a stalemate. Assad’s regime begins to splinter as more officials defect or are killed by rebel fighters. As opposition forces grow stronger the violence intensifies and claims more lives. Rebels seized control of all of Syria’s border crossings with Iraq on July 19, 2012, dealing a new blow to President Bashar al-Assad. Photo by Bulent Kilic/AFP/Getty Images. Amid media reports that chemical weapons are being moved out of storage to major cities, the Assad regime says although it has chemical weapons, it won’t use them on civilians. The government and rebels are locked in a battle over the city of Aleppo. Residents flow from the city, contributing to a refugee crisis. 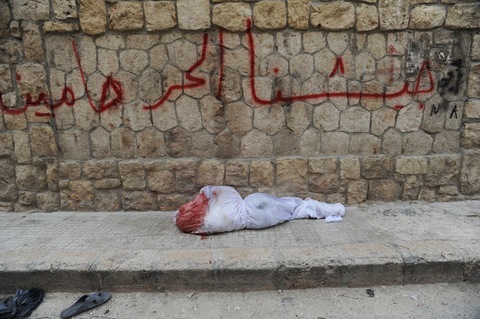 A body wrapped in a bloody shroud lies on the sidewalk in Aleppo, Syria, on July 29, 2012. Photo by Scott Peterson/Getty Images. Kofi Annan steps down as special envoy to Syria, and U.N. Secretary-General Ban Ki-moon accepts his resignation. “Tragically, the spiral of violence in Syria is continuing,” Ban says. News agencies reported President Obama signed an order earlier this year allowing CIA and other support for the Syrian opposition. The White House did not confirm the reports.